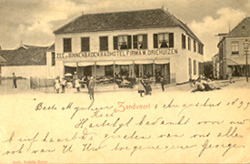 One of the best ways of finding out about the Zandvoort of old and also indeed about the people who lived in the village and the tourists who visited it is to browse through original old Zandvoort postcards. In this part of this site you will find photo galleries (listed below) with clear scans of some of the postcards from the authors personal collection. 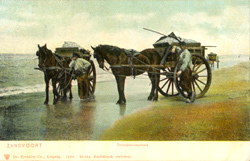 Take the time to examine the postcards in much detail and you will discover a world and way of life now long since gone, people long since passed on and a calm idyllic world which is so difficult to find today. Here you will find people of different classes usually on holiday but quite often at work. There are fishermen or women, people plying their trade on the beach and many other groups and individuals. The beach is always a wonderful place to have fun and in this section of old Zandvoort postcards you will find people of all age groups from the very young to the very old. You will see how differently people dressed in past times and how the seafront in Zandvoort changed after the 2nd World War. Here again in these old postcards of the Zandvoort buildings of former times you will see how many of the wonderful Belle Epoque mansions and villas disappeared from the village During the German occupation when much of the seafront was destroyed in order to build sea defences. However some of the old buildings still endure further in the centre of the village. This section of old postcards is great to peruse before your next visit to Zandvoort as you will be able to walk down most of the same streets that you see in these cards. You will be able to compare the buildings from former times with the buildings still standing today. 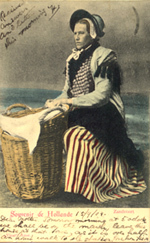 In this group of old Zandvoort cards you will find mostly natives of the village at work either in the dunes or on the sea. Some of the old Zandvoort postcards have personalised messages written on their fronts which make them quite fascinating. Sometimes they’re written in English and sometimes by Dutch tourists on holiday at the seaside but whichever language you can understand, by reading the scribbled notes on these old postcards you will get a fascinating insight into the lives of people who lived such a long time ago but many of whose thoughts are just as relevant today…..enjoy!